Thank you to everyone that participated in the assignment, both from a “submitter” and a “reviewer” standpoint. This exercise ended up being more difficult than I thought it would be, and kept me looking for an appropriate scene all week long, which helped to train and exercise my photographic “eye.” I also experimented with several Photoshop techniques, but didn’t feel that any of them really panned out. The guidelines for the "Color" assignment were: "Color should be the primary compositional element in your image, and should be used to convey meaning, set the tone or mood of the image, or evoke an emotional response in the viewer." I enjoyed viewing all of the submissions. Several of the entries were great examples of using a specific color to convey meaning (such as the yellow bicyclist in “Tour de France, and the orange “Fire”), while others used our minds response to certain types of colors (bold primary colors or softer pastels) or tonality (Haunted House) to set the mood of the image. Still others were more along the line of a “still life” that played with color as a compositional element. This was an excellent set of images that obviously were successful in getting people to think about color as a compositional element. The image selected for “People’s Choice” (popular vote) was “Behind the Smile.” As with most great images, this image was a complex image that worked on several levels. The bright colors caught the viewer’s eye, and the interesting composition held the viewers attention long enough so that they noticed the expression on the man’s face. This expression and resulting “human interest” gave the image much more “depth” than a simple colorful composition. The Editor’s Choice for Artistic Merit goes to “Behind the Smile” submitted by Naomi. This is a well executed image that succeeds on several levels. Not only is it pleasing to the eye, but the human interest provokes our curiosity and makes an emotional connection with the viewer. The Editor’s Choice for Technical Merit goes to “Fire” submitted by Rod. Good images of fire are very tough to record. If I go back through my image files, most of my image of fire are lacking in some way or another. I noticed from the EXIF that Rod was using a “spot” metering pattern, and so was obviously making a conscious decision on where to set the exposure. 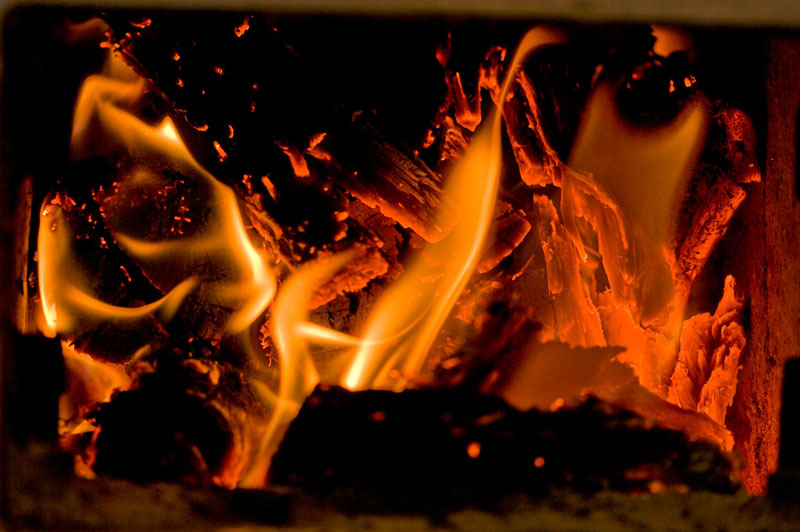 The composition is very nice as well, and successfully conveys the image of FIRE. Honorable Mention goes to “Yellow and Blue Flowers” submitted by Tom (Kermit). This is a colorful image that succeeds on both a technical and artistic level. 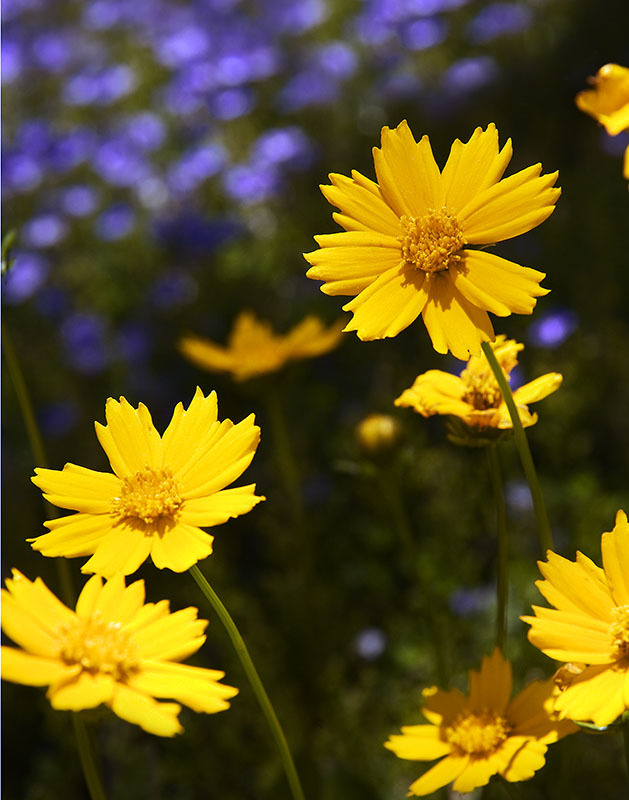 The yellow and blue flowers complement each other well, and the foreground and background are well balanced. In a perfect world (inside joke) the “dead space” below the yellow flowers would be filled in; however the image is still very pleasing to the eye. I would have also cropped a bit tighter on the right in order to remove the distracting “partial” flower in the upper right of the image and tightened up the composition a bit. Thank you fellow members and Keith for choosing "Behind The Smile" as your favourite. The person I photographed was experiencing a very difficult time in his life, but dressed up as a clown at our Church Fair. 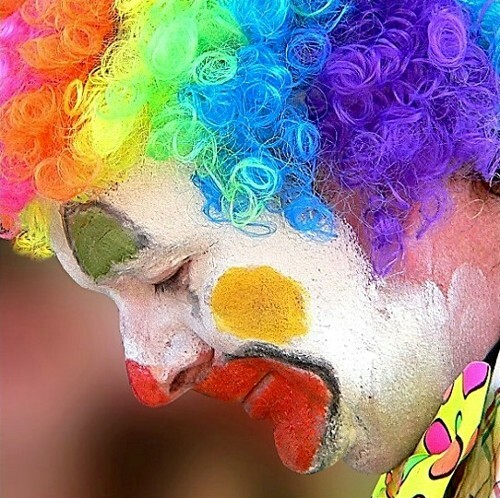 I've often wondered, if a clown would always be happy or would there be a time when, even with all the make up and jokes, the true self would be revealed. So thank you once again ! It is especially rewarding when a great image has an interesting story behind it. Wonderful work. I hope we will see many more such images from you.